In his first live-action film since 2000's Cast Away, Robert Zemeckis directs Denzel Washington in Flight, a picture that pays homage to both common definitions of the word. In the movie, Washington plays a troubled-but-talented airline pilot who manages to successfully land a crashing commercial jetliner despite being under the influence of more substances than you could count, and whose alleged inebriation causes his heroism to be called into question. The film, though, is only peripherally about the kind of "flight" that involves either flapping wings or screaming jet engines, and only spends about a quarter of its runtime there. 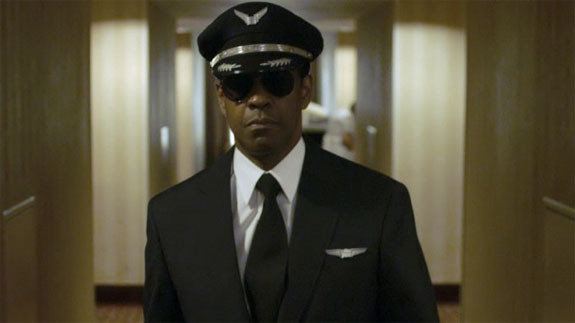 Flight wants to go deeper: Denzel's Whip Whitaker is a man running away. In the same way that he uses one drug to counteract the effects of another, he uses one image of himself (strong, competent, and free) to obscure some more distressing truths about his person. Whitaker is on the run from the truth about himself. Flight spends most of its time painting a graphic, realistic, and relentless picture of the life of an addict, and therefore of the life of a human person, echoing St. Paul's lines from Romans 7: "For I do not do the good I want to do, but the evil I do not want to do -- this I keep on doing (v 19)," with one important difference: Whitaker thinks he knows what he's doing! It's always worked out before, and even when things seemed to be going tragically wrong, he was able to perform in ways that no other pilot (even a sober one) could. In the film's most powerful scene, a fellow (though more honestly introspective) addict (Kelly Reilly) tells Washington that she's worried about him. "Worried about me?" he responds. "Worry about you! We're not the same...I choose to drink!" "It doesn't seem much like a choice to me," she replies. Reilly's character has added the "I do not understand what I do" of Romans 7:15, and tears the blinders from Washington's flight from himself. For every scene in which Washington promises sobriety (even when it is in his obvious legal interest to do so) there is a companion scene, showing us his continued spiral toward bottom. In the end, it is the bottoming out that leads to freedom. "I might be a chump," he says in a final scene, "but I couldn't tell any more lies." The most common lie we tell is one to ourselves, that we have it all together, that we know what we're doing, and that we're in control. It takes a bottoming out, (one that is surprisingly moving, due to its predictability, in Flight) to lead us to the promised land. "My grace is sufficient for you," the tagline might as well read, "for my power is made perfect in weakness" (2 Cor 12:9).